SNA recognizes that training staff is not without its challenges. You are tasked with training different types of learners and this can often be difficult. Your learners all bring something to the table but how to you leverage that? How do you meet the needs of your learners in the time that you have to train? 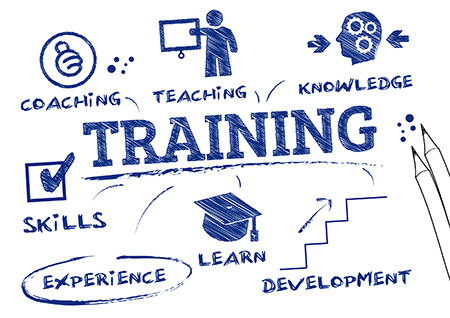 SNA has pooled a few resources that can assist you as you prepare to train your staff. A great way to get started is to review SNA’s Guide to Developing Training for Adult Learners. 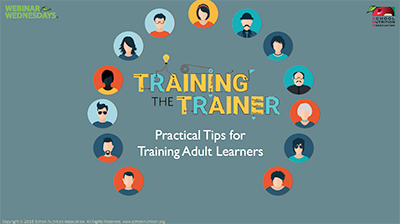 This guide provides you with insight into training your adult learners along with practical trainer tips that you can use as you prepare your training. Use this online learning styles assessment for yourself or for your staff. This quick assessment helps adult learners to think more about “how” they learn. In this webinar participants discovered the different learning styles of adult learners and how to engage your audience to provide them with a valuable training experience. Watch this webinar to walk away with actionable methods of improving your school nutrition training efforts. SNA CEUs are awarded after the successful completion of the post-webinar quiz. Today’s school nutrition professionals are comprised of varying generations. It can often be challenging to find common ground when training four (and very soon five) different generations. All have different values, motivators and learning styles. We all view the world through our generational filter and as you know what works for one person may not work for another. Thinking about training for different generations, different motivators and different learning styles may make your head spin! Yet training must take place and must also be effective. 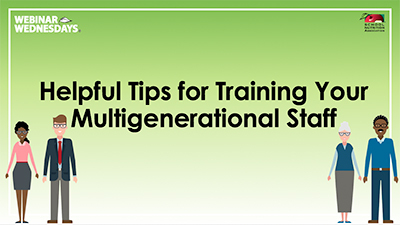 This webinar will provide insight to help you understand the differences of the varying generations, what motivates them, and how to successfully engage them in a training environment. The Institute of Child Nutrition’s Adult Learning is designed to be a supplemental online course to the Foundations of Training Excellence Master Trainer face-to-face course. The purpose of this course is to enhance the trainers' ability to actively engage trainees in training for improved learning and improved job performance.